Tony Romo had a great and complicated NFL career. The story that sprung up around him was somehow even more interesting. For many Cowboy fans, the prototypical Tony Romo play features the former face of the franchise evading an opposing defensive lineman to buy Jason Witten and Dez Bryant just enough time to break free, and then firing the ball through the smallest of windows before being slammed to the turf. Wait, that's not it. That’s not it at all, at least for most Cowboys fans. For them, the prototypical Romo play is the game-sealing turnover that follows a few plays down the line, the play where moments after awing fans with his innate ability to make an awe inspiring play, Romo fires, or fumbles, the ball into the hands of an opposing defender. That idea of Tony Romo, the QB just good enough to lose the game at the last second, happens to be a lie. But it was a lie that Cowboys fans latched onto as a truth. It was a way of both dismissing Romo and laying the blame for the many variously flawed Cowboys teams he led on his shoulders. That’s not the type of player that Romo was, not at all. But it was the role that was forced upon him, or that he was unlucky enough to inherit simply because he had the mixed blessing of spending a decade under center for America’s Team. In 2003 Romo was the undrafted free agent the Cowboys brought into camp, both because scouts saw something in the Walter Camp Award winner and because the team was in need of quarterback with incumbent starter Quincy Carter underperforming and backup Chad Hutchinson epitomizing the concept underwhelming. When the Cowboys moved on from Hutchinson, they signed head coach Bill Parcells' favorite Vinny Testaverde and traded for prospect Drew Henson, which meant Romo seemed doomed to be a early training camp cut. It didn’t happen, both because Quincy Carter’s substance abuse problems took him out of the running and because Tony Romo was, it turned out, the only real NFL quarterback in the bunch. Not right away, though. Romo mostly served as the team's holder on field goals and extra points at first, and showed flashes of promise in the preseason as the Cowboys made their way through quarterback after quarterback before settling on Drew Bledsoe in 2006. Bledsoe's tenure as the Cowboys starter would be short-lived; at halftime on October 23, 2006, Romo came on to replace the underperforming 34-year-old. His first pass was tipped and intercepted. Romo would go on to throw two touchdowns in that game, as well as two more interceptions, but the promise was enough for Parcells to name him the team’s starter just two days later. Romo went on to post a 6-4 record and help Dallas to a Wild Card berth. 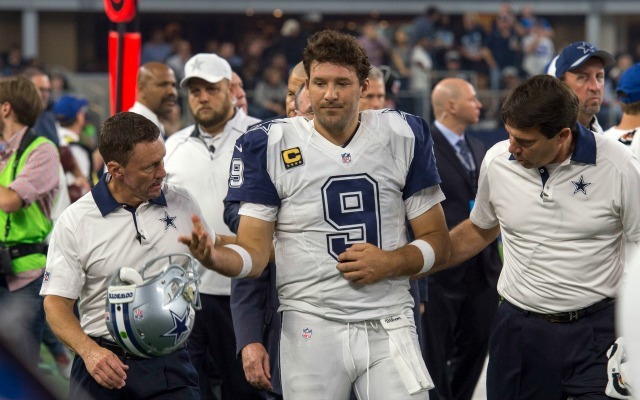 It was in that Wild Card game, the very existence of which was Romo’s first significant NFL accomplishment, that his first nationally televised disaster occurred. As time ran down in a hard fought game with the Seattle Seahawks, Romo led his team to the 19-yard line, and to within a field goal of their first playoff win of the new century. Romo, who had been the team's holder on kicks since he came into the league, fumbled the snap, then attempted to find the end zone after the recovery. He didn’t, and the Seahawks would go on to win the game, and eventually the NFC; Romo, for his part, was a punchline for a few weeks. Still, hopes were high for what Antonio Ramiro Romo could do for the Dallas Cowboys, which—given where he had come from and where the Cowboys had lately been—was something like an achievement in itself. Romo made good on those hopes, and quickly. The next season Romo would lead the Cowboys to a 13-3 record, set the team record for touchdowns in a season, date celebrity marine biologist Jessica Simpson, and uh throw a heartbreaking interception late in a playoff game against the eventual Super Bowl Champion New York Giants that ended the Cowboys season. With back to back season-ending turnovers on his resume—and a predictable and retrospectively laughable media uproar in Dallas centered around a bye week trip to Cabo San Lucas with teammates—the narrative was now set. Tony Romo was great enough to get a team to the edge of glory, but weak enough to blow it right when he was about to reach the promised land. Good, sure, but also surely not good enough. That was the story, and it stuck. Everything that you’ve just read I wrote a month ago, when word came down that the Cowboys were planning to release Romo as a cap casualty on June 1. There was more, too: the injuries, the playoff losses, the bizarre Jerry Jones quotes, the rise of Dak Prescott, and the charming aspects of Romo’s personality and a consideration of where he fit into the broader continuum of The Dallas Cowboys Saga. That’s out, now. What matters now is what’s new, and this is the news that Tony Romo is about to embark on a chapter of his life where he's not a forced punchline, and no longer constantly at risk and on the verge of some new and hideous injured. For the first time in years, Tony Romo will get to be the thing that he so strikingly was even when he was also one of the quarterback of the world's most famous NFL team: a normal guy. Or, anyway, as normal of a guy as a person can be when he is still the former quarterback of the world's most famous NFL team, and now the number one color commentator for the NFL on CBS. There's always been a sense of melancholy to Romo—the gloomy look he always carried when something went wrong suggested that in some ways that first formative fumble never left his mind, or that he’d somehow picked up the story that he was just football's Charlie Brown. Always trying, always giving it all, doomed to swing and miss at the last second. And while his statistical performance puts him up there with the great quarterbacks of his era, they never once went his way in the way that matters most to Cowboys fans. Every time Romo was on the cusp of breaking through, and moving beyond his past foibles and perhaps on to a Super Bowl, something terrible would happen. He’d throw a game-ending interception, or he’d break a rib or a bone in his back, or Dez Bryant would catch a ball that would have been replayed forever as a great playoff moment if not for a poorly thought out rule that flipped the outcome and ensured that it would instead be replayed forever as great playoff tragedy. That’s just the way it always went for Romo, and last season’s injury and the subsequent rise of Dak Prescott, looks in retrospect like the final push he needed to start thinking about calling it a career. Romo rather unexpectedly called a press conference when he was added back to the Cowboys’ roster from injured reserve at the end of the season, and instead of giving the usual answers about teamwork and doing what's best for the team, Romo admitted his time in Dallas seemed to be up. In a particularly bleak bit of it, Romo went full Rust Cohle, minus the Lone Star cans. "Seasons are fleeting,” he said. “Games become more precious, chances for success diminish. Your potential successor has arrived.” It was one of the starkest and most honest moments from an athlete in recent memory, and stood out all the more because of the NFL’s broader cultural resistance to that kind of honesty, or insight. Maybe we should have know the Romo ride was over with right there, and maybe we should have left the poor guy alone at that point, and concentrated on more important things. That we didn’t—we the people who care about sports and we the people who argue about it in print and online and on television and honestly wherever possible—owes something to how accustomed we’ve become to quarterbacks playing well into their late 30s; Peyton Manning and Brett Favre near their peak levels for some of that time, and Tom Brady somehow still seems to be getting better. The end always comes, but there is a way that it usually goes. It’s how it went for Unitas, Namath, Montana, Favre, Manning, and many of Romo’s other peers. A player that we know as one thing excels right up until he becomes a different sort of player, and fails. The self-belief that makes these players great ensures that they are always the last to know. Or, anyway, almost always. It is entirely possible retirement is just a Cowboy thing. Roger Staubach called it a career after just a decade in the league, Danny White played 12 years, and started eight before injuries and the writing on the wall made him hang up his cleats. Rumors surrounded Troy Aikman suggesting that he'd bolt to San Diego to be a Charger before he decided that his health was more important than playing a full 12 seasons. With 14 seasons under his belt, Romo played longer than them all. That he opted out when he did seems, in retrospect, not surprising at all. The signs seemed to be there—the injuries kept adding up, his replacement was replacing him in front of our very eyes, and he had a growing young family at home. It made sense for him to step away from the game, and he has always seemed, in his unassuming way, a little more clear-eyed about where he stood than someone like Favre ever was. If it was surprising to Cowboys fans when Romo made his decision, I think it was mostly because we didn't want him to. Even though he's long been the punchline of jokes, Romo still played for—and for a period defined—America's Team. That old Cowboys grandiosity and Romo’s underdogginess don’t naturally fit together in the abstract. In reality, though, it worked better than anyone understood in the moment. There's nothing more underdog then a mixed-race kid from Wisconsin becoming the best college player at a lower level, ending up as an undrafted free agent, almost getting cut, and then grabbing the reins of the biggest team in the country’s most popular sport. The rest of what comes with that came to Romo, but all that—dating pop stars, backing into massive fame and having a great time while doing it all—was made possible not just through his own excellence, but through a healthy amount of pure luck and coincidence. That's a true American tall tale. It never got the fairy-tale ending we'd expect from a story of this scale, but while many may have sneered at Romo's many misfortunes, he was never a villain; I’d wager that many people with no love in their heart for the Cowboys also hoped that Romo would one day get the redemption he kept fighting for. It's never going to happen now, although he is also much less likely to suffer another spinal fracture. Maybe Romo will become the greatest color commentator of all time. Maybe he'll fulfill his dream of making the US Open as a golfer. We wanted him to eventually put it all together and win, but we don’t always get what we want. It says a lot about Tony Romo that him getting what he wants—the life he is choosing in walking away—still feels like something worth cheering.